What Medications Does CBD Interact With? Each year CBD is proving to be more and more valuable and is being found to work as a potential treatment option for an increasing number of medical conditions. But, while the compound can be an important part of treatment plans for a variety of ailments, there’s still the question of how CBD interacts with other medications. Just about all chemical compounds, from prescription pharmaceuticals and over-the-counter drugs and illicit substances, have some sort of an interaction with each other. For instance, there are allegedly 82 drugs that interact with caffeine. 25 of these interactions are classified as moderately severe to severe. Another example is alcohol. We’ve all heard how alcohol could counteract the effects of some pharmaceutical medicines or possibly have adverse side effects when mixed. The difference is that, while alcohol is a recreational substance, most people use CBD for medicinal purposes, which makes this a very important issue. We all know that cannabis and its counterparts are much safer than most recreational and pharmaceutical drugs out there. But “safer” doesn’t mean that it’s 100% safe. While CBD is a very reliable medicine on its own, we are still unsure about how it may interact with all the other substances that we consume. 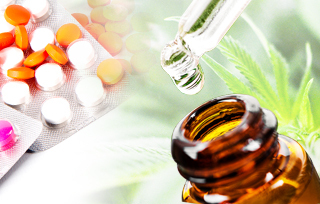 In this article, we will take a look at what medications CBD could interact with. CBD is a “potent inhibitor” of two key liver enzymes – CYP2D6 and CYP3A4 – that according to a report published by the District of Colombia & Department of Health break down many over-the-counter and prescription drugs. According to the report, the CYP3A4 enzyme breaks down one-fourth of all drugs. By interfering with the metabolism in the liver, CBD may increase blood levels of certain drugs. 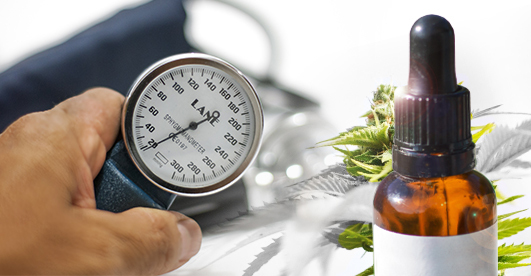 Essentially, what this means is that if you are taking drugs to lower your blood pressure, CBD could completely counteract the effect. In other words, you might as well not even be using the drug. 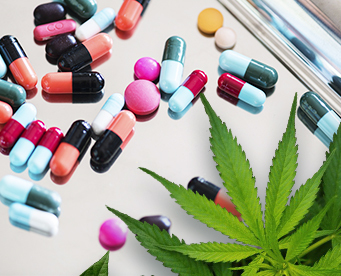 While CBD is well-known and proven to be a very effective treatment option for seizures and epilepsy, it doesn’t interact well with certain antiepileptic drugs. 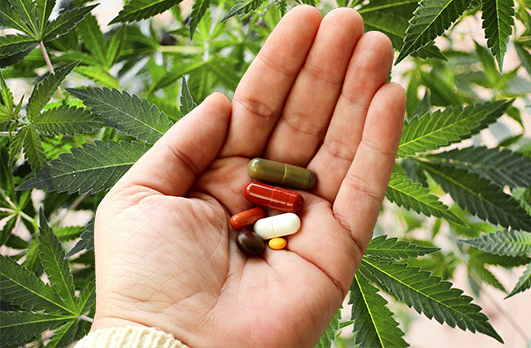 Studies have found that CBD could lower the blood levels when used with some of the most commonly used antiepileptic medicines. One of the most commonly used epileptic medications is Clobazam. Clobazam is altered and broken down by the liver. However, CBD could decrease the speed at which the liver breaks down the Clobazam. This means that the effects and side effects of Clobazam may be increased. For example, one particular study found that using CBD regularly could increase the level of Clobazam in both adults and children. Those with heart conditions need to be especially careful when CBD since it can cause heart rate levels and blood pressure to fluctuate. This means that it could increase your risk of suffering a heart attack. Those who have only just started using CBD or haven’t yet developed a tolerance for it need to be extra cautious. But CBD may even slow down the heart rate of regular consumers. Beta blockers and other blood pressure medicines often have opposite effects on the heart rate. For instance, they may reduce blood pressure but slow down the heart rate. For regular CBD consumers, there’s a chance that the CBD will boost the effects of the beta blockers because it adds to the effects of slowing down the heart rate. Some of the most well-known beta blockers include Atenolol, Bisoprolol, Propranolol, and Nebivolol. DOES CBD OIL INTERACT WITH OTHER DRUGS THAT INCREASE THE RISK OF BLEEDING? CBD could increase the effect of any drugs that are used for blood thinning, like heparin or Warfarin, or other drugs that are known to have their own risk of blood thinning, i.e. Ibuprofen or Naproxen. This is because CBD may slow down the metabolism of these drugs. 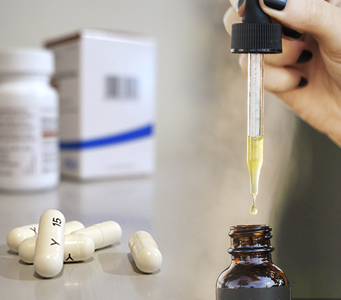 While most patients who use blood thinners together with CBD don’t suffer any negative side effects, there’s always the possibility that it could cause some complications. Some studies have found that CBD has a few mild anti-coagulating effects. What this means is that CBD could increase warfarin levels which could be quite dangerous. In other words, adding CBD to the mix may have the same effects as taking a double dose of warfarin. Benzodiazepines, such as Xanax, Valium, or Klonopin are primarily used to treat anxiety, but could also be used to manage other conditions, like insomnia. CBD could possibly inhibit an enzyme that the liver uses to metabolize these types of medicines, which could cause the levels of these drugs in the body to go up. This means that the blood levels of these benzodiazepines could increase and cause more sedation. In addition, it could cause more serious problems, such as overdosing on the medication. Many sedatives, like benzodiazepines, alcohol, and some antidepressants have an influence on the GABA neurotransmitters that are found in the central nervous system, and this causes calming effects. CBD can also produce sedative effects. So when combined with these kinds of medications, the CBD could have additive effects and could be quite risky. DOES CBD INTERACT WITH ANTIDEPRESSANTS MEDICATION? CBD can be used to make people feel happy, relaxed, and less stressed out. For this reason, CBD is a popular treatment option for depression and anxiety. But, there are, of course, lots of people who also use prescription antidepressants. One of the most well-known antidepressant medications on the market is Prozac. It’s used to improve energy levels, mood, appetite, and sleep. One of the big challenges when it comes to prescribing antidepressants to those who already use CBD is determining the correct dosage. Although rare, adverse interactions do exist between selective serotonin reuptake inhibitors (SSRIs) and CBD. Based on some isolated reports, there’s the chance that combining CBD with SSRIs like Prozac may increase the risk of hypomania – a mild form of mania. Our metabolism is what is responsible for how quickly we process the substances in our system. Cytochrome P450 is one of the enzymes in the liver that helps to metabolize CBD and more than 60% of all pharmaceuticals. One of the dangers with CBD is that it takes full control of the enzyme and demands all of its attention. When we consume CBD, the liver will stop metabolizing the other drugs that use the same enzyme. If you are using a powerful painkiller, such as oxycodone, consuming CBD at the same time could cause it to stay in the system for longer than it should. These kinds of drugs are very carefully dosed to only stay in the system for a certain period of time; anything longer, and you at risk of suffering from negative side effects, like nausea and drowsiness. When used regularly, liver damage is a very serious consequence of a slow metabolic process. In summary, be sure to speak with a doctor if at all possible if you’re concerned about CBD interacting with other drugs. While you’re probably in the clear and don’t have much to worry about, it’s always best to steer on the safe side of a potentially hazardous situation. Copyright 2019 ShoppingCBD | Disclosure: This is a review site and therefore it’s important to understand that none of the products listed on this site have been evaluated by the U.S. Food and Drug Administration. These products are not intended to diagnose, treat, cure or prevent any disease. All information presented here is not meant as a substitute or alternative to information from health care practitioners. Please consult your primary doctor before using any CBD product. Furthermore, all of the product reviews listed on this website are honest reviews from our team’s personal experience. While this site may be compensated for sales that arrive from this site, the opinions of these products are sincere and based on first-hand experiences. Logan from Ashburn just bough! Judah from Ashburn just bough! Angel from Ashburn just bough!